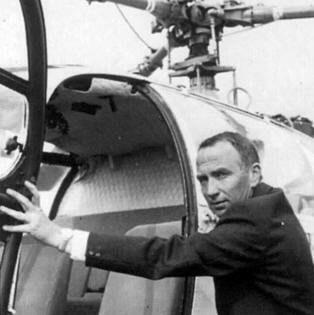 February 18, 2011 - First hired in 1947 by the SNCASE, which would later become Sud Aviation and then the Helicopter division of the Aerospatiale Group, Jean Boulet was one of the greatest pioneers in the history of rotorcraft flight testing, he died on February 15, 2011. Just a few highlights from his illustrious career include the first flights of the SE3000, the SE3101, the Alouette, Frelon, Puma, Gazelle families and the Lama. The records he established are no less impressive. Jean Boulet would set 17 world records during his career, including the record for the highest altitude. Behind the controls of a Lama, Jean Boulet reached an altitude of 12,442 meters on June 21, 1972. The Lama was designed specifically for altitude performance and during demonstration flights in the Himalayas during 1969, an SA315B carrying a crew of two and 120 kg of fuel landed and took off at the highest altitude then recorded, 7,500 m (24,605 ft). On 21 June 1972, a Lama with a single pilot (Jean Boulet) aboard established a helicopter absolute altitude record of 12,442 m (40,814 ft), instantly followed by an inadvertent record for the longest ever autorotation when the engine flamed out at the peak altitude of the flight. The longest autorotation in history was performed by Jean Boulet in 1972 when he reached a record altitude of 12,440m (40,814 ft) in an A?rospatiale Lama. Because of a −63?C temperature at that altitude, the engine flamed out and could not be restarted as soon as he reduced power. By using autorotation he was able to land the aircraft safely. His record still stands today. Jean Boulet received the prestigious "X Supa?ro" engineering degree from the French aeronautics institute in Toulouse, and chalked up more than 9,000 flight hours during the course of his career?including over 8,000 in helicopters. The courageous pilot was well known for his love of flying and derring-do, but was also widely respected for his modesty and unassuming nature. The SNCASE SE.3120 Alouette ("Lark") was a utility helicopter developed in France in the early 1950s but which did not enter production. Designed in parallel with the SE.3110, the Alouette shared that machine's dynamic components, with the exception of its unusual twin tail rotor. The Alouette featured an open-framework fuselage behind a cockpit that was enclosed by a bubble canopy. Skid undercarriage and tricycle gear were both tested. The first flight took place on 31 July 1951 with Jean Boulet at the controls. In 1953, he would pilot one of the two prototype Alouettes to set a world closed-circuit distance record for a helicopter in this class, covering 1,250 km (780 miles). Despite this impressive performance, the Alouette proved to be difficult to maintain, and with work on the turbine-powered Alouette II (an unrelated design) already underway, development of the Alouette was soon abandoned. Established in 1992, the Franco-German-Spanish Eurocopter group is a division of EADS, a world leader in aerospace, defense and related services. The Eurocopter group employs approximately 15,600 people.